Biography of English Plein-Air Landscape Artist. the 19th century English school. 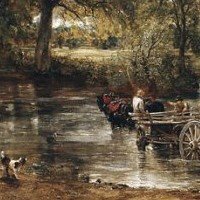 One of the best English painters of the 19th century and a major contributor to English landscape painting, John Constable ranks - along with JMW Turner (1775-1851) and Richard Parkes Bonington (1802-28) - as one of the three best landscape artists in Britain. Born in June, 1776 at East Bergholt, Suffolk, the son of a prosperous mill-owner, Constable was from an early age responsive to the natural beauties of his birthplace. "I associate my careless boyhood", he wrote later, "with all that lies on the banks of the Stour. Those scenes made me a painter, and I am grateful." He showed an early interest in painting and drawing, and was encouraged by John Dunthorne, a local plumber, glazier and amateur artist. He was also introduced to the famous patron and amateur painter Sir George Beaumont (1753-1827), and to the professional engraver JT Smith. After working for a time in his fathers mill, he went to London and in 1799, with the encouragement of the landscape painter Joseph Farington (1747-1821), he began training at the Royal Academy Schools. Through Beaumont, Smith, and Farington, he became familiar with the European tradition of landscape painting, particularly the works of the French master Claude Lorrain (1600-82) and the Dutch painters of the 17th century, such as like Aelbert Cuyp (1620-1691) and Jacob van Ruisdael (16281682). But Constable was already dedicated to depicting the countryside around his native Stour Valley in his own more direct and informal way. As early as 1802, the year he exhibited his first landscape at the London Royal Academy exhibition, he wrote to Dunthorne: "For these past two years I have been running after pictures and seeking the truth at second hand ... I shall make some laborious studies from nature ... There is room enough for a natural painter." Although he was to paint several portraits - sometimes with success when he was intimately concerned with the sitter, as is shown by the portrait of his fiancee Maria Bicknell (1816; Tate Gallery, London) - his main concern for the whole of his career was with the painting of the English landscape. Constable's early development as an artist was slow; drawings made during sketching tours of the Peak District in 1801, and of the Lake District in 1806, show the diverse influences of Beaumont, Thomas Gainsborough (1727-88), the Cozens, and Thomas Girtin (1775-1802). But he found that picturesque sights and mountain scenery did not greatly appeal to him, and he did not undertake such tours again. He wanted to depict nature directly and accurately, as is shown by the notes he made on drawings recording the time of day, the climatic conditions, and so on; but some of his paintings, such as Dedham Vale (1802; Victoria and Albert Museum, London), are composed in the formal manner of Claude, an artist Constable always admired. From about this time he began to explore more intensely the pictorial possibilities of the countryside around his Suffolk home, making small oil sketches in the open air and experimenting with brighter, more varied colours to convey the effects of light and atmosphere. He also made small pencil drawings, notably those in the sketch-books of 1813 and 1814 (Victoria and Albert Museum, London). With immediacy and brilliance, he recorded his observations, not only of details of foliage, of agricultural equipment, of men at work and at rest, but also of any scene that might be used later as the basis for a composition. These outdoor sketches in oil and pencil were intended as preparatory work for the highly finished oils he painted in his studio and exhibited annually at the Royal Academy. 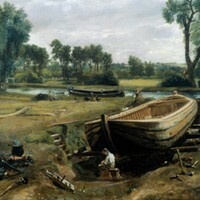 On one apparently unique occasion, however, when he was working on Boatbuilding near Flatford Mill (1815; Victoria and Albert Museum, London), Constable painted wholly in the plein air. In 1816, after a long and difficult courtship, Constable married Maria Bicknell, and by 1820 had settled in Hampstead, London. It was in 1819, the year he was elected an Associate of the Royal Academy, that he revealed the full results of his studies and the extent of his talent in his painting of The White Horse (Frick Collection, New York). This was the first in a series of six large oil paintings (approximately 4 by 6 ft) depicting everyday life and work on the River Stour. Like his earlier painting Flatford Mill on the Stour (1817; Tate Gallery, London) these works were intended to raise the status of his landscape painting at the Academy. The most famous of the series is The Hay Wain (1821) which was exhibited at the London Royal Academy as simply Landscape: Noon. This picture not only exemplifies the verdant, sunny qualities of the English countryside in summer, but also creates a quiet mood of utter contentment. Man is seen here as completely at one with his environment: an image that perfectly illustrates one aspect of the Romantic attitude towards the relationship between man and nature. For The Hay Wain, and for some other larger works, Constable made a full-size preliminary sketch in oils. This practice doubtless inspired the greater freedom of handling evident in his exhibited works of the 1820s, for example his use of the palette knife as well as the brush to apply paint, and his extensive use of touches of white colour to give a glittering surface texture. By 1825, when he painted the last in the great series, The Leaping Horse (Royal Academy of Arts, London): he was undecided whether to send the finished oil to the Academy exhibition, or the preparatory sketch (1825; Victoria and Albert Museum, London). The two works were almost identical in their degree of finish and their loose, rapid brush strokes. There is always evident in Constable's mature works an impressive confidence in the beauties of nature itself; he once claimed that his "limited and abstract art is to be found under every hedge and in every lane." He wrote to his friend John Fisher in 1821: "old rotten planks, slimy posts, and brickwork, I love such things ... as long as I do paint, I shall never cease to paint such places." It is one indication of his originality that he expressed this view when the formality of the classical and picturesque styles of landscape painting was still universally expected and admired. Although Constable travelled very little in England, places outside Suffolk became familiar and important to him as subjects for painting during these years. There was Salisbury, which he first visited in 1811. There he met John Fisher who was to be a life-long friend and whose uncle, the Bishop of Salisbury, commissioned the famous view of the Cathedral (1823; Victoria and Albert Museum, London). There was Brighton, where he first took his family in 1824 because of his wife's poor health, and where he painted some remarkably fresh and vivid beach scenes. The periods he spent at his home in Hampstead encouraged his interests in climatic change, particularly in the formation of clouds. Despite his belated election to full membership of the London Royal Academy in 1829, his later years were unhappy. In 1828 Maria died, leaving him with seven children, and his friend Fisher died four years later. Constable never fully recovered from these bereavements. His sporadic black moods seem to be expressed in the stormy atmosphere and restless brushwork of his paintings during these years, for example Hadleigh Castle (1829; Paul Mellon Center for British Art, New Haven) and the dramatic preparatory oil sketch for that picture (c.1829; The Tate Gallery, London). Also around 1829, Constable began work on designs to be engraved in mezzotint by David Lucas and published as a series of fine art prints entitled English Landscape Scenery, a project presumably undertaken in emulation of Claude and Turner, and intended as a summary of the artist's ideas and achievements. Some of Constable's opinions on landscape were expressed in the accompanying text, and were expanded and extended in lectures he gave in Hampstead in 1833 and 1835. He died on 30 March 1837. In the 1830s, Constable achieved more expressiveness in his work; he aimed less at the careful naturalistic depiction of a scene and more at an immediate record of the light and atmosphere of the moment and their fleeting effect on the sky, foliage, and water. This expressiveness is seen at its most intense in the later outdoor sketches in watercolours, a medium he used more frequently in these years, and in the elaborate finished oils such as The Valley Farm (1835; Tate Gallery, London), the last great Suffolk picture. The most turbulently Romantic of all the later works is perhaps the remarkable watercolour Stonehenge (1835; Victoria and Albert Museum, London), in which the mystery of the subject is enhanced by the disturbing presence of the double rainbow and the dramatically ominous sky. The naturalism of Constable's art was recognized in his own day; Henry Fuseli remarked to Callcott in 1823 that Constable "makes me call for my greatcoat and umbrella". He achieved this naturalism largely by close observation, at times of a scientific intensity. He not only consulted scientific treatises, concerning meteorology for example, but also believed, as he stated in a lecture given in 1836, that his profession was "scientific as well as poetic". He was particularly interested in the effects of light and shadow, with which he attempted to suggest the transient qualities of the scene before him, to depict what he called the "chiaroscuro of nature". The advice he received from the President of the Royal Academy, Benjamin West, in 1802, that "light and shadow never stand still" was described by Constable as the best lecture on chiaroscuro he had ever heard. Constable's place in early-19th-century Romantic art is assured partly by this interest in the transience of nature, but mainly by his belief that "painting is with me but another word for feeling". For Constable, a landscape could express a poetic mood, as in The Cornfield (1826; National Gallery, London), which gives a visual interpretation of the lines from James Thomson's poem Summer which accompanied the picture when it was exhibited at the British Institution in 1827: "A fresher gale begins to wave the woods and stir the streams, Sweeping with shadowy gusts the fields of corn." The boy drinking from the stream in the foreground of the picture also calls to mind certain passages from Wordsworth's The Prelude. Constable also possessed a grand, cosmic vision, different from that of Turner but no less intense. Both artists were able to convey their own feelings for the basic forces of nature, for the powerful vibrancy of the living landscape. Constable's achievement, like Turner's, was so original and individual that he had few followers among English artists; his closest imitator was Frederick William Watts (1800-62). However, his paintings were much copied and forged. Although he never traveled abroad, his work was known in France; several works were exhibited and sold in Paris, notably The Hay Wain which won a Gold Medal at the 1824 Salon. Eugene Delacroix (1798-1863), among others, especially admired Constable's work, calling him "one of the glories of England" and adopting to some extent his loose, broken handling of paint. Constable's principal influence in France was more far-reaching; his work was admired by the Barbizon group of landscape painters, whose consequent interest in naturalism and plein-air painting was to provide a suitable background for the Impressionists later in the century. His impact on other famous painters leaves no doubt as to Constable's position as one of the greatest landscape painters in the history of art. Along with William Hogarth, Thomas Gainsborough and JMW Turner, he was one of the first great English painters of the 18th and 19th centuries. There are works by Constable in many of the best art museums around the world, notably the National Gallery, and the Tate Gallery, both in London. The main collection of sketches in oils, watercolours, and pencil is at the Victoria and Albert Museum, London, mainly because of the bequest in 1888 by the artist's daughter Isabel.  For more biographies of great modern artists, see Famous Painters.  For more about English landscape painting, see: Homepage.